Supergrass Biography, Discography, Music News on 100 XR - The Net's #1 Rock Station!!! 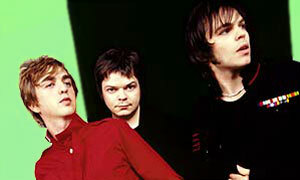 The Aternative-Rock Pop-Rock outfit, Supergrass, was formed in 1994 in Oxford, ENGLAND by guitarist+vocalist Gaz Coombes, bassist Mickey Quinn and drummer Danny Goffey. Recorded that same year, their first single, "Caught By The Fuzz", initially was issued on the indie label Backbeat Records and it later became part of a split EP released by Fierce Panda. The trio finally scored a new deal with Parlophone Records who re-released the single which hit #42 on the U.K. Pop chart; it was followed by "Mansize Rooster", "Lenny" and the breakthrough smash "Alright" which shot to #2 on the Official British Singles chart. In the summer of 1995 was released the band's debut album, "I Should Coco", the record topped the U.K. Albums Sales chart and went platinum. Supergrass returned with its sophomore album, "In It For The Money", in the spring of 1997, prefaced by the top 5 hit single "Going Out"; two more U.K. top 10 hits, "Richard III" and "Sun Hits The Sky", helped push the album to #2 in their native England where it earned platinum certification. "In It For The Money" was also a success on the American Billboard Top Heatseekers chart backed by the Modern Rock top 40 hit single, "Cheapskate". Two and half years later, the trio released their self-titled LP, known as The X-ray Album; their third full-length, which was also their third platinum album, spawned a couple of hit singles in the U.K. with the infectous "Pumping On Your Stereo" and the top 10 hit "Moving"; "Supergrass" eventually climbed to #13 on the Billboard Magazine's Top Heatseekers chart. Almost exactly three years later, the band re-emerged with its fourth LP, "Life On Other Planets"; this album was recorded in the South of France this time with Robert Coombes, the older brother of Gaz, on keyboards; it entered the top 10 of the British Top Albums chart and its singles "Grace" and "Seen The Light" hit #13 and #15, respectively, on the National Pop chart. The album also cracked The Billboard Top 200 Sales chart, debuting at #195. 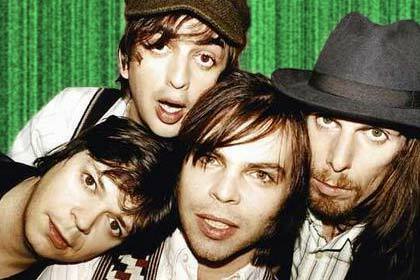 In mid-2004, the now four-piece act, assembled the "Supergrass Is 10" compilation, the set contained two new songs, including the U.K. top 30 single "Kiss Of Life" and the B-side to "Lenny" single, "Wait For The Sun". The Oxford-based quartet duly delivered their fifth studio album, "Road To Rouen", in August 2005; the disc which included the top 20 hit single "St. Petersburg", earned the band yet another British top 10 album. In March 2008 Supergrass released "Diamond Hoo Ha". In keeping with their post-Britpop musical growth, this album saw the four-piece adopting a spikier sound than on previous, more reflective records. The 11-song set debuted at #19 on the U.K. Top 20 Albums chart; "Diamond Hoo Ha Man" was the first single to be taken from the CD. After over 16 years of making music together, Supergrass split up in June 2010.